Sitting at the kitchen table in Kristen and Anthony’s charming home, you might think you're in the company of newlyweds. This endearing couple playfully tease each other, laughing when their recollections don’t line up perfectly. These traits have served them well in life. 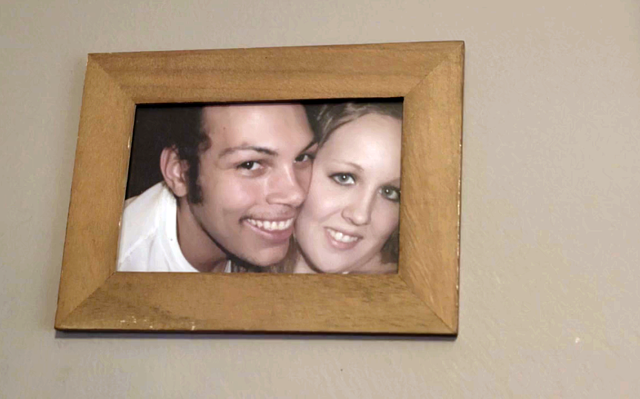 Married at just 18 and 20, this couple has been through a great deal in the last decade. Thankfully, the challenges seem to have reinforced their relationship. They first met in Lindsay, a small town in Ontario. 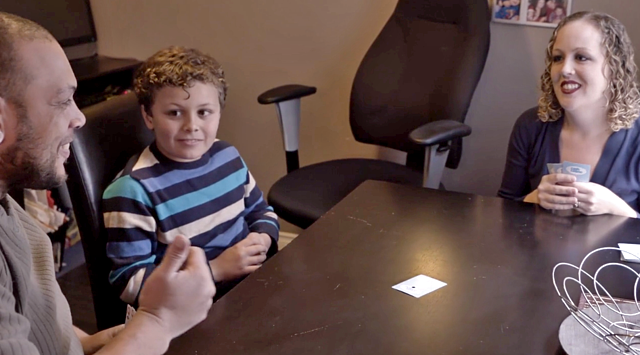 When their son was born in 2007, Anthony moved to Calgary, where the job prospects were brighter. “I couldn’t even get a minimum wage job back home,” Anthony explains. Kristen followed just three months later with baby Dominic, eager to start building their life. KRISTEN AND ANTHONY WERE MARRIED AT JUST 18 AND 20. THEY FIRST MET IN LINDSAY, A SMALL TOWN IN ONTARIO. "I actually landed a job before I got here,” Anthony says. However finding suitable accommodations proved challenging from the get-go. Rent was very expensive. They made do with minimal furnishings – a pullout couch, a crib, an IKEA table, and a tube TV – because they had no disposable income after paying for necessities. They lived in a very rough neighbourhood, where the residents seemed to barter for rent. When they tried to upgrade to a slightly nicer apartment, their utilities were disconnected because they couldn’t afford to pay them. Eventually they moved into a house with friends –three families, each with a toddler sharing space. It was tough living in such close quarters. Everyone parented differently, leading to strained relationships. “Even petty things became an issue,” Anthony says. In 2010, their second son Marcus was born. Gradually the other families moved out; revolving roommates became the norm. Even after one roommate settled in long-term, they never felt stable. “Life before Habitat? In a word, chaotic,” Kristen declares. Living in uncertainty meant they never felt confident planning. Despite the struggles, each weekend, they would scour the paper for free activities that their kids could enjoy. despite their struggles, Each weekend, Kristen and Anthony would scour the paper for free activities that their kids could enjoy. A blister on Anthony’s foot caused by his work boots morphed into an ulcer. He went to bed fine on a Thursday; by Friday, he was nearly incapacitated. Due to severe complications from diabetes, Anthony’s foot was amputated to treat the infection; eventually he was fitted with a prosthetic. Nonetheless, he persevered. After being on disability for a short time, Anthony changed occupations and became a Calgary Transit driver. “I am so proud of him. He had to leave a career he loved, and adapt to a new one. But he did it to take care of his family!” says Kristen. "I am so proud of him," kristen says. When they were living in a rental on Memorial Drive, they felt trapped. The streets were so busy they deemed it unsafe for their children to play outside; they were especially concerned about Dominic who has autism and was sometimes impulsive. After a flooded basement, their landlord performed a cursory clean up and put back the original drywall leading to issues with mold. Their roommate struggled as he suffers from asthma. “Hard to complain in a landlord’s market,” Kristen sighs. The chronic stress of housing instability was wearing them down. They were worried about the impact on their kids – they could see it and feel it. Might there be a better way? 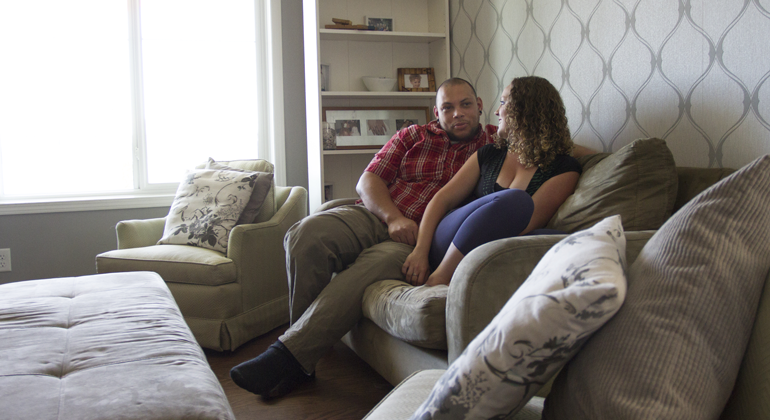 Kristen and Anthony lived in a rental on a busy street in Calgary. so busy, they deemed it unsafe for their kids to play outside. “It was very tough, but we were determined. 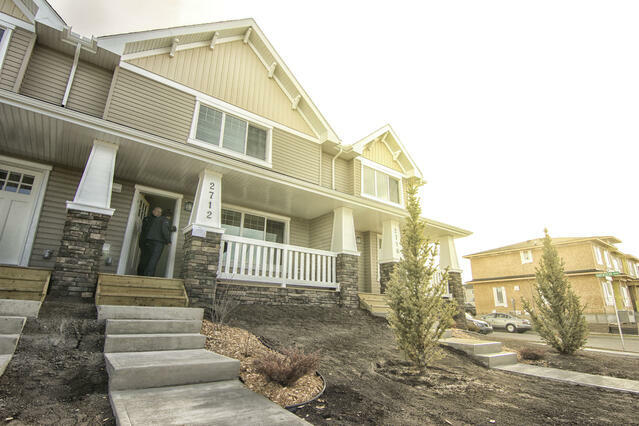 Seeing our neighbours’ houses being completed really motivated us." In 2016 Kristen and Anthony applied to be Habitat homeowners after attending an information session. When they were selected, they felt blessed. They tackled their 500 required hours with gusto, completing them in seven months – well below the average time. Anthony had a challenging time due to working split shifts as a transit operator. He would drive for four hours, volunteer for four hours and then drive a second four-hour shift. Kristen took turns building their home and volunteering at the ReStore when she had support with childcare. They kept meticulous records to track their progress. “It was very tough, but we were determined. Seeing our neighbours’ houses being completed really motivated us. I think we were running on adrenaline, to be honest,” says Kristen. at the airdrie Home Dedication in november 2016. “We have been through so much, we were afraid to hope. Even after we’d finished our hours, we would tell our kids, ‘We are probably getting this house.' It wasn’t until we had the keys in hand that we actually believed it!” admits Kristen. Their kids (now 7 and 10) are able to ride their bikes to school and to see friends. They love having their own space – separate bedrooms and a secret "hidy-hole" in the basement. Dominic and Marcus even deliver the local community paper together; they are already saving. "There is a sense of peace and stability. It took us a while to realize that we could decorate our house without asking permission," they recount, laughing. They are tackling one room at a time – wallpaper in the living room, Pokémon and Mario posters on the kids’ walls. They even bought some furniture from the ReStore. “Life after Habitat equals peace of mind,” states Kristen. Anthony exhales deeply in agreement. “I just love popping my head out the back door and saying, ‘Hey neighbour!’ It may sound silly, but that’s like the first time I’ve ever done that,” chirps, Anthony. Kristen chimes in, “Habitat did a great job picking partner families. We all helped each other do our hours. We look out for each other’s kids; we have coffee together.” Talking over each other excitedly, they explain they will be hosting a community BBQ soon. “I’ve been squirreling money away – we are going on our first official family vacation – to Disney World! The boys are so excited,” beams Kristen. “Kristen planned it. All I know is, I get to drive,” grins Anthony. 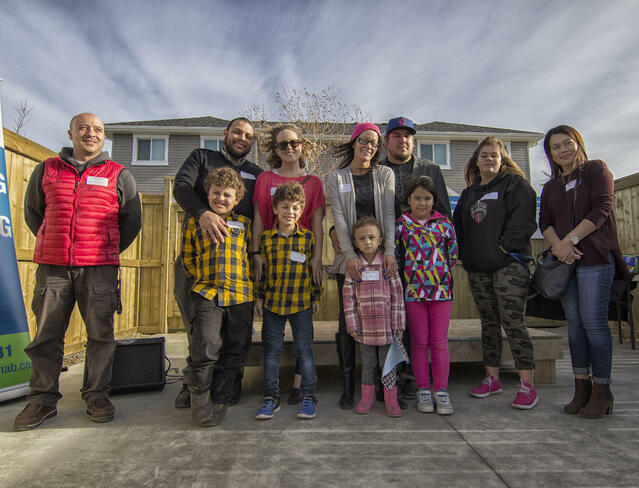 Kristen and Anthony seem unsure how to answer, “Where will you be in five years?” However – safely ensconced in their Habitat home, with their menagerie of pets including a feisty dog and two cats – they believe, “Anything is possible now; we’re so happy. Hey, and don’t forget the lizard!” Anthony quips. and are looking forward to what the future holds.